We’ve always been on-the-fence about CCleaner. It has some great features, but it also has a very “iffy” registry cleaner. For a time Microsoft warned users about CCleaner’s registry cleaner. Then a while back Avast bought CCleaner and we knew it wouldn’t be long before Avast ruined it. Avast, once a great company, now creates products that rival the best PUPs and hijackers. We have cleaned dozens of computers supposedly protected by Avast only to find a lot of malware and PUPs infecting them. I was working on a computer the other day and I thought the customer was using Chrome. I did a double take when looking at the extensions. It was the Avast browser that apparently was installed without the user’s knowlege or explicit permission. Not only did it install it also set itself as the default browser. When you first look at it, it looks exactly like Chrome. But under the hood you’ll find it has 6 or 7 preinstalled Avast extensions that cannot be removed. Avast continues to prey on its trusting users. Now they’ve included annoying and hard-to-stop advertising pop-ups in the latest version of CCleaner. 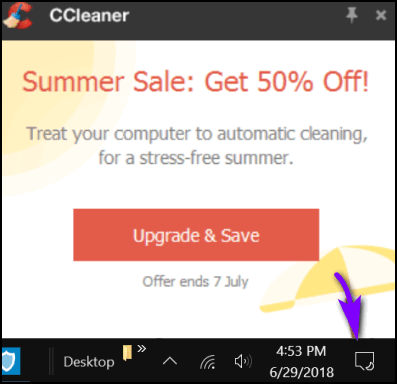 CCleaner displaying advertising in annoying popups. Avast seems offer freeware only as a method to instigage an array of billboards (ads) on the target’s (customer’s) PC. If a company wants to give something away that’s great. And it’s okay if offer more featur in a paid version of the product. But what Avast is doing is ridiculous. Avast’s primary program is Avast Antivirus. But now the stuff they install and/or try to install on trusting users’ computers is nearly as bad as the stuff they’re supposed to be protecting users from. It’s easier just to dump CCleaner and use Windows Disk Cleanup or use the very nice junk files cleaner the comes with HiBit Uninstaller. I don’t think that either of those are as easy to use as CCleaner, but both do a good job if you’re careful. I’ve used CCleaner for years and years, but after reading this I am going to uninstall it. Thank you. I have a question relative to CCleaner. I downloaded and used a program that is from the same site as CCleaner. That program is Recuva, a program Cloudeight used to endorse. Am I running into something I don’t want as it is part of the CCleaner web site.. I am concerned as you might think. Please advise? Piraform is now owned by Avast. Whether the other Piraform products will be laced with advertising we don’t know – but it seems logical to assume so. We have recommended Speccy and Recuva in the past, but now they are owned by Avast we probably will cease those recommendations. I have never used CCleaner, and never will, it does not ‘clean’ everything and never did but many users of computers don’t realize a ‘surface clean’ and an in-depth clean are completely different. I have used Privazer for many years, faultless in it’s operation, simplicity in guidance throughout the different phases of a clean-up throughout the nooks and corners of a user’s computer, and a simple ‘look-and’see’ link to see what rubbish has been found. I have spent many years studying, using and understanding the aspects of computers, TC & Darcy have spent many years assisting the novice, and experienced computer users, I have spent many years with Eightball and Thundercloud on a daily/weekly basis since day one of CloudEight ….. and the ongoing bits, bytes, kilobytes, megabytes, gigabytes and into the future of infinity, TC & EB have led a way for computer users to learn, at no monetary cost, the good, bad ugly programmes foisted upon vulnerable users …. …… I gave up trying to assist family and friends with advice passed on from TC & EB … too many people are ‘dumb is-dumb does, and this, ‘local bloke’ has solved computer problems for neighbours and friends, no cost except for one suggestion, that is to join Cloudeight and InfoAve …. bricks don’t listen or respond when spoken to …. lots of human bricks are bricks of skin and bone …. up for the Snake Oil Medicine Show, get the APP, lication, join the rest of the zombies to be found On FACEBOOK, the greatest illegal method of sucking innocent dumb-bells out of their souls, and I bet CCleaner want YOU to find them on FARCEBOOK. I’ve used CCleaner for years but I am going to uninstall now because of what you said here today. Question: I have Reg Organizer, will this work as well as the programs you’ve suggested. Hi Susan, yes Reg Organizer has a great Clean Up tool, but if you use Jump Lists and browser stored passwords, be sure you don’t delete them when you use the system cleanup. I don’t know what a Jump List is so I guess I don’t need to worry about them. Jump Lists are great. If you right-click on a program’s icon and the program supports Jump Lists, you’ll see a list of recently opened files. If you have Chrome on your PC, it supports jump lists. Right-click on its icon in the taskbar and you’ll see a list of sites you’ve recently visited. We’ll republish our jump lists article soon. I really like them. They’ve been around since Windows 7.
can i use junk file cleaner and registry cleaner safely in HiBit Uninstaller? I hesitate to use those tools, since, with my luck with computers, I would probably end up getting into trouble with my computer. – the junk files cleaner is great… we didn’t test the registry cleaner because most do more harm than good. So, you use the registry cleaner at your own peril. I forgot to ask this question. Why does the HIBit Uninstaller take so long to load? That’s the only drawback to the program. HiBit unninstaller does not take an excessively long time to load. The more programs you have installed, the slower it will load since it has to load the list of programs, date installed, registry data, program data, etc. It completely removes programs including all the things that the program uninstaller leaves behind. The more programs you have installed – the long it will take to load. I have quite a few programs installed and I don’t think the start up time is excessively long. is do the same remarks basically apply to another Piriform prog called Speccy which I will also get rid of if need be . Must I uninstall another Piriform prog called Speccy ? Piraform is now own by Avast. Whether the other Piraform products will be laced with advertising we don’t know – but it seems logical to assume so. We have recommended Speccy and Recuva in the past, but now they are owned by Avast we probably will cease those recommendations.